Email was the original "killer app" of the online age; it was the tool so desirable that people were willing to buy into the Internet boom just to have it. And in spite of all the communication methods that have rolled out since, including text messaging, instant messaging, and social networking, email remains king. Email makes communication simple. Regular, unencrypted email messages are sent in clear text or some other easily readable format regardless of the email program used. This interoperability is what makes email vulnerable. Email, as it travels through routers and mail servers on public and private networks to its destination, can be intercepted and read - and even altered - at any point by a third party if it is sent unencrypted. 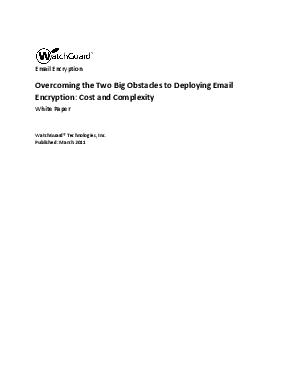 Read more to learn more about overcoming the obstacles of deploying email encryption.